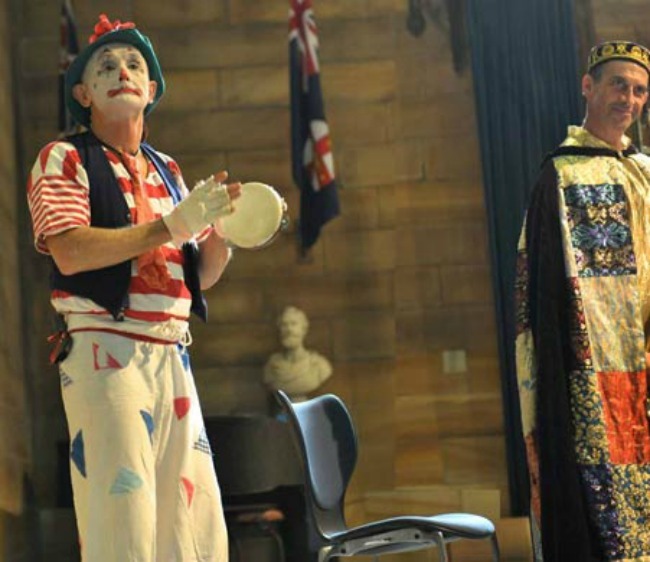 Just after dusk for five nights, from Wednesday May 27 to Sunday May 31, SHE ONLY BARKS AT NIGHT will be performed around the University of Sydney by Sydney’s The Living Room Theatre, in between the Sydney Vet School Roundhouse and Macleay Museum. This follows the sell out success of their previous production She (Still) Cries at Night. 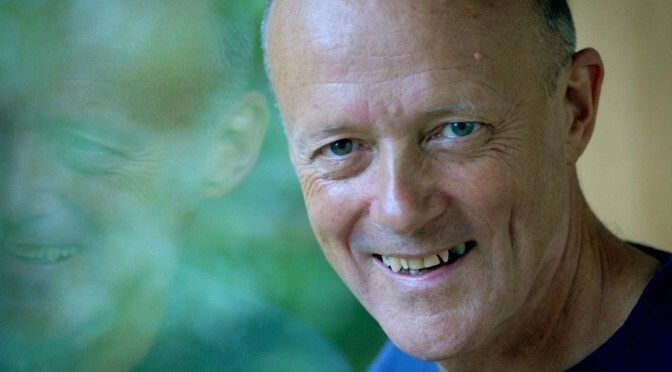 British playwright R.C. 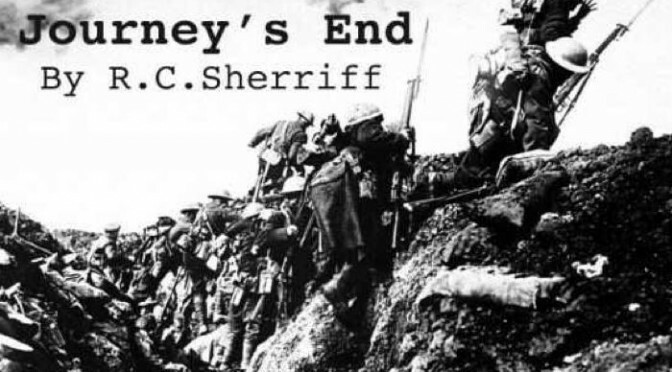 Sherriff’s drama JOURNEY’S END presents a detailed and harrowing account of the hell that is war fought in the trenches. 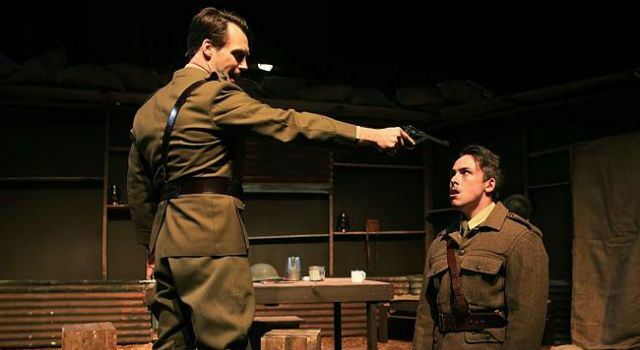 A classic of its genre, Sherriff’s play was wrought out of his experiences as an officer in the trenches during the First World War. The play was first performed on the 9th December 1928 at London’s Apollo Theatre, in a production by the Incorporated Stage Society, and starred a very young Laurence Olivier. Outdoor music festivals in Sydney have enjoyed, on average, a history of eight to ten years. The Renaissance Players presented, by impressive contrast, its staggering 36th ‘Runnymede Pop Festival’ recently. 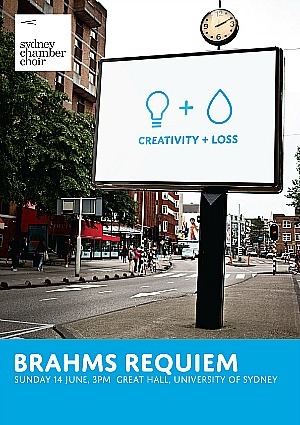 Their tradition of reviving and celebrating early music continued formidably, combining several elements of festival entertainment. These features included an engagingly bright stage set and an informative, attractively designed program guide for festival goers. The Renaissance Players made a hauntingly effective entrance from the rear of the venue. They were summoned to the stage by ancient woodwind and led by Jessica O’Donoghue’s focussed ‘Sa Sibilla’ chant concerning the Day of Judgement. The trials and tribulations of life as an arts writer are are put in perspective after having a night as enjoyable as the one I have just had. It’s a Saturday night and I have just been at Tarboosh, a wonderful Lebanese restaurant in Penshurst Street, Willoughy. The ‘house’ was full…mostly groups of women having a great time…no idea where the men are tonight…probably being incredibly boring, staying at home watching the footie on tele.. The drink and the food, glorious Lebanese delights, kept arriving..
Tonight it was a show as well as dinner. Onto the makeshift shift stage at the front came an exotic young woman, Farah, who went on to perform her belly dancing show for the patrons. 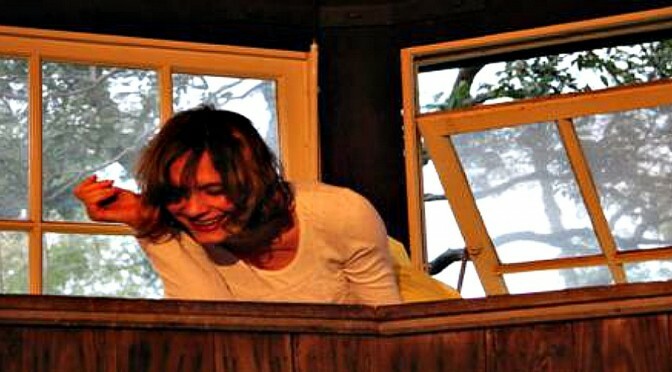 Everyone was entranced as she works the room, getting young and old up and dancing. It was easy to see that Farah was deriving a lot of pleasure from the experience. As prearranged, she came and joined me after to share a meal and to tell me some of her story. Our chat was as exciting and suprising as her performance. She came across as a very vibrant woman who has ‘packed’ a lot into her life. Originally from Trinidad in the Carribean, she went to the States after graduating and completed a degree in Biology in the Ivy League at Columbia University. 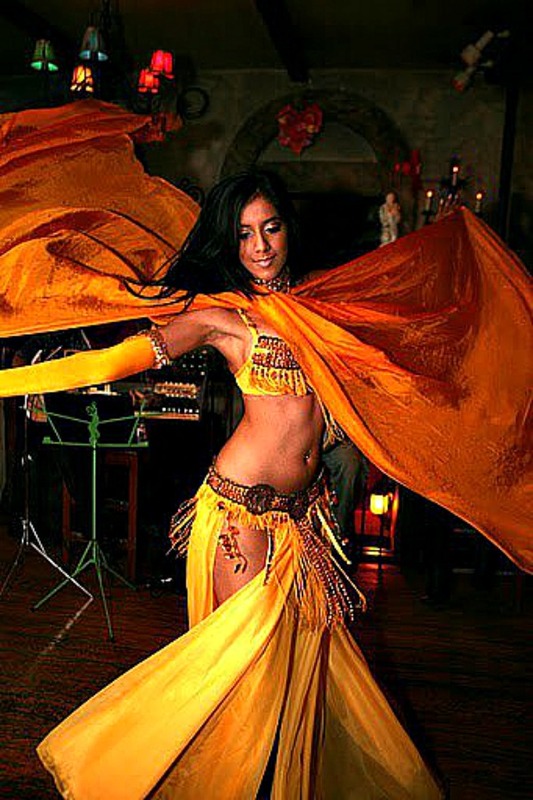 It was whilst she was a student at Columbia, some ten years ago, that she took up bellydancing for exercise, which has now florished into a career that sees her traveling around Sydney to different venues. Some nights she can perform up to five shows. Traveling is one of Farah’s grand passions. She is well traveled, including Europe and the Middle East, and as a matter of course she always takes her dancing accoutrements with her. Farah shared some wonderful stories. She told how she was traveling solo in Tuscany in Italy when she decided to dine at an intimate local restaurant. The staff were a little shocked to see an attractive young woman dining alone. A waiter brought a glass of wine over to her. No wallflower, Farah showed him some photos of her dancing. He insisted that she perform a routine for her. Farah slipped out the back to put on her gear and the restaurant was treated to an impromptu performance. Farah said that it turned into a night out of a Hollywood movie…the patrons and the staff, including the manager and the chefs, came up and chatted to her. I think it would be a reasonable enough thing to say that there aren’t too many bellydancers currently performing in Sydney who are qualified as lawyers. Farah was admitted to the Supreme Court in February this year. In the months before qualifying she worked as a Paralegal for a leading law firm in Circular Quay. The firm had a happy hour every Friday night. Some of her colleagues in the firm had been making requests for her to put on her show for the office. One Friday night before Christmas she agreed. Another Hollywood moment…The office was transfixed by her routine and impromptu dancing started around the office. The following Monday morning she was typing away at her desk when the firm’s senior partner came up to her desk and started trying to do some of the moves. They both had a good laugh. Farah said she was putting her law career on hold for the moment. ‘It’s very dry.’ She might come back to it later if she needs to. ‘I have to go now’, and with this, Farah signed off. She bid her farewells and flew off to her next engagement. I took my time driving back home, over the Bridge, taking in Sydney’s beautiful nightscape. Writing about people in the entertainment industry can be an unsatisfying experience. This was a pleasure. 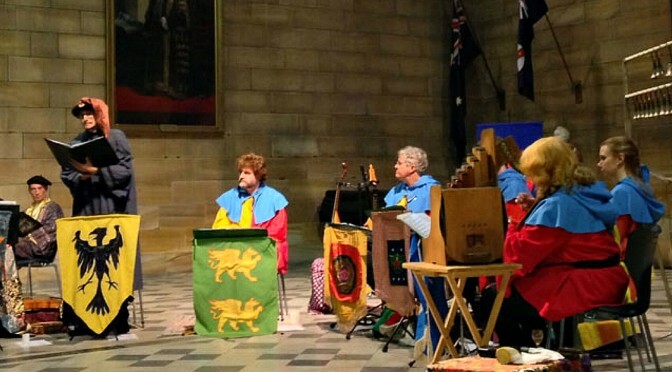 The long history of colourful concerts by The Renaissance Players continues with the definite success of their latest offering, British Birds, Beasts & Bards. Carrying the subtitle of “popular traditions of British music & poetry c. 1300-1977” the equally enthralling and colourful souvenir programme suggests substantial and staggering possibilities. 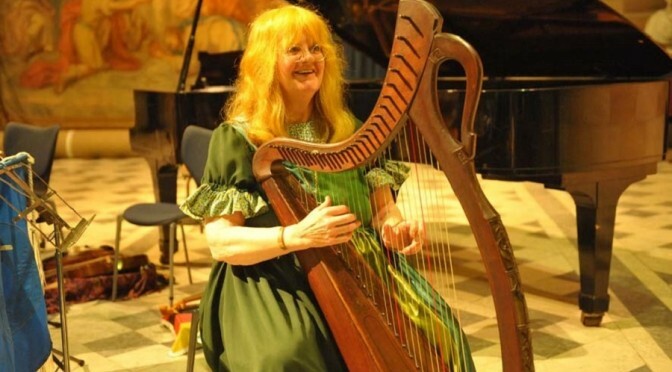 Director Winsome Evans has ensured a fine blend of vocal and instrumental music fills the British Proms style concert, where many ‘birds’ and ‘beasts’ from the British tradition can be depicted by the Players. 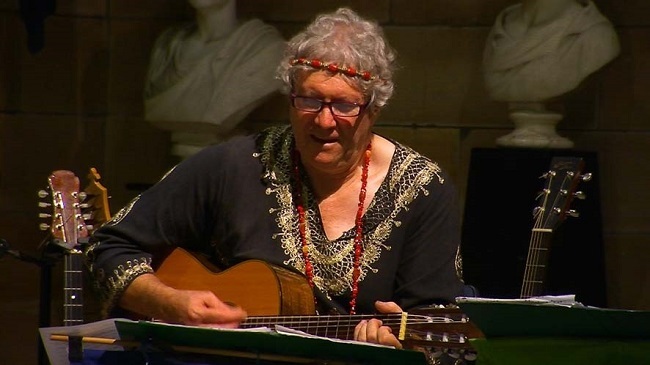 Words of a variety of bards are brought to life through the highly entertaining and animated readings of Geoff Sirmai.